Dickies Lab Coats are high quality work apparel for health care, science, or technology workers. Teachers and professors will also appreciate a well-tailored lab coat for classroom wear. Twill fabric in a polyester and cotton blend protects from spills while offering lightweight, easy-care comfort. 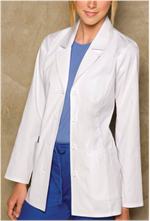 Dickies Lab Coats for women are tailored perfectly to fit your shape. Shapely princess seams and perfectly notched collars give a professional, not baggy, look. Great fit is essential during a long day in the clinic, classroom or laboratory. Choose 3/4 sleeves or long sleeves to suit your comfort and your need to protect other clothing. Enjoy the convenience of roomy pockets for your work essentials. A wide range of sizes is available, so everyone at the office, hospital or lab should be able to find lab coats that fit. Dickies Workwear has a well-deserved reputation for durability, so expect years of service from these quality medical lab coats.